I make these in a single, deep, 8-inch cast-iron skillet, but a 9- or 10-inch skillet would also work, or two 6-inch skillets. If you don't have a cast-iron skillet of the appropriate size, you can also use a metal or Pyrex cake pan or pie plate. Put the butter in an 8-inch cast-iron skillet and place over low heat. Alternatively, put the butter in a similarly sized cake pan or pie plate, and place it in the preheated oven for a few minutes. As the butter melts, use a pastry brush to coax it up the sides of the skillet. Meanwhile, in a blender, mix together the eggs, flour, half-and-half, and salt until well blended. Pour the egg mixture into the warmed skillet. Slide into the oven, and bake for 18 to 25 minutes. The mixture will rise and puff around the edges, like a bowl-shaped soufflé. 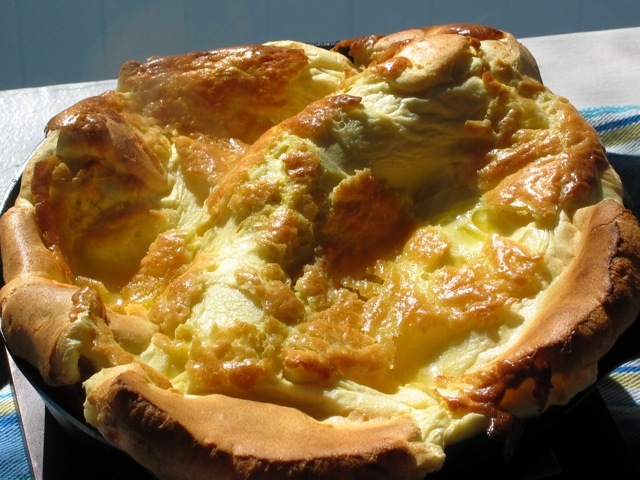 The Dutch baby is ready when the center looks set and the edges are nicely risen and golden brown. Remove from the oven. Drizzle — or splash, really; abundance is good here — with lemon juice and sprinkle generously with powdered sugar. Serve immediately.